The Capitol 10,000 is the largest 10K in Texas. When the Cap10K was off to the races in 1978, it had 3,400 participants. Looking forward to the 42nd, the local race has not only grown to become the largest 10K in Texas, but also the sixth largest in the nation. In 2018, more than 23,200 registered for the annual Austin tradition. The race starts on Congress Avenue Bridge. Travel northbound to E. 11th St. and turn right; Travel eastbound on E. 11th St. to San Jacinto Blvd. and turn left; Travel northbound on San Jacinto Blvd. to E. 12th St. and turn right; Travel eastbound to Trinity St. and turn left; Travel northbound to E. 15th St. and turn left; Travel westbound on 15th St. to Enfield Rd. ; Travel westbound on Enfield Rd. to Winsted Ln. and turn left; Travel southbound on Winsted Ln. to Lake Austin Blvd. and turn right; Travel westbound on Lake Austin Blvd. to Veterans Dr. and turn left; Travel eastbound on Veterans Dr. to Stephen F. Austin Dr.; Travel eastbound on Stephen F. Austin Dr. to W. Cesar Chavez St. and turn right; Travel eastbound on W. Cesar Chavez St. to S. First St. and turn right; Travel southbound on S. First St. to W. Riverside Dr. and turn right; Travel westbound on W. Riverside Dr. to finish line at traffic circle. Four Aid Stations are located along the course approximately one-and-half miles apart. New this year nuun electrolytes, lemon lime and strawberry lemonade served at each station. Each Aid Station is supplied with water, nuun electrolytes, restrooms and minor first aid supplies like band aids and ice packs. Each Aid Station is in direct communications with the race’s Medical Support Team by radio. Runner Transport* vehicles are available upon request and can be summoned by Aid Station Captains. *Runner Transport vehicles provide non-emergency transportation back to Auditorium Shores in the event that a participant is unable to complete the race. Each Aid Station is approximately half a city blocks in length; participants are advised to continue moving through the Aid Station if the first tables are too crowded to conveniently obtain fluids. Looking for a great spot to cheer on friends and family members, stay tuned we’re organizing some great locations that will surely motivate all to the finish line. The Cap10K is happy to continue this tradition for families participating with a baby jogger. The Family Baby Jogger Starting Area is a family friendly staging area for baby joggers with a few great perks. Families are invited to take advantage of free reserved parking at the Austin American-Statesman, conveniently located at the start line (parking pass required, first-come first-served, limited quantity). Parking pass will be sent to registrants that selected ‘I will be participating with a stroller’ box at the time of registration. Once you’ve parked, join us at the baby jogger staging area near Corral D for family only restrooms, diaper changing tent, complimentary juice boxes, and free pinwheels for kids. 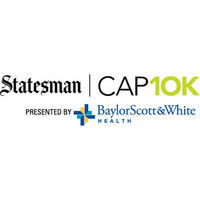 The Statesman Capitol 10,000 race has a course time limit of 3-hours and 30-minutes for wheelchair athletes and 2-hour limit for all other participants, at which time the course will re-open to vehicular traffic. Participants must maintain a 20-minute per mile pace (approximately) and complete the 10K (6.2 mile) distance—start line to finish line—within the event time requirement. Participants not maintaining the pace to finish within these times will be directed to get onto the sidewalk by race officials and the finish line will not remain open beyond this finishing time. Those who finish outside of the time limit will not be recorded as official finishers and may not receive full on-course support from Aid Stations and traffic personnel. Spectators can electronically track multiple runners along the race course by receiving real-time updates via text messaging from Run-Far Racing. Updates will be received as runners cross the 5K halfway point (3.1 miles) and at the 10K (6.2 miles) finish line. In 2014 the race premiered the first King & Queen of the Hill Challenge to race participants—winners to receive the prestigious polka dot jersey. The King & Queen of the Hill Challenge pits runners to compete up one of the notable hills on W. 15th St. at West Ave. The challenge is from Nueces St. to West Ave., approximately two city blocks. All participants will be timed on the ascent. The fastest participant times between the two timing mats on the ascent will be crowned King & Queen of the Hill. Polka dot jersey awarded to one male and one female in each of the three categories: Overall, Masters, and 19 & under. Be sure to smile for their cameras as you run or walk along the race course! Race photographers will be capturing you multiple times throughout the race course as well as before and after the race. Smile when you see the race photographers in the bright yellow vests and make sure your bib number is clearly centered and visible on the front of your body so they will be able to identify you. Race photographers will also be at the finish line area taking photos to help you celebrate your accomplishment. Running Photo Locations for the Statesman Capitol 10K: Starting Line, Congress Ave. Bridge, Winsted & W. 12th St., Winsted & Quarry, Guadalupe & Cesar Chavez, Finish Line and at the Post Race.